Have you ever taken a questionnaire survey , or had one created for your company? KPIs from Survey data are used by many organisations, and lets them find out what their customers think of them. But, collecting this data is only the first step; it’s often difficult to visualise this data and make it understandable. This article will show you how to make sense of your KPI data from surveys using dashboard software, and visualise that data to find the information you need. To do this, I will give an overview of survey methods. Then, I will show how data from surveys can be used to calculate and report on two important KPIs: the Customer Satisfaction Index and the Net Promoter Score. Chances are that you’ve encountered a questionnaire before. Surveys are one of the most common ways of getting important, detailed feedback from customers and staff. If you’ve never created one before, the first thing to realise about surveys is that they actually collect KPI information. If you’re taking a survey on your satisfaction as a customer, this means that a company wishes to know more about how it can improve itself, and take action. Detailed information for this is required, hence the need for the survey. To make survey results understandable to a dashboard software program, your survey will need to be sorted into a numerical format. Here are a few tips for achieving this. For surveys to be easily transferred to a dashboard program, it is quickest and easiest to create and distribute your survey online. You can use many free programs to do this. While mailing your KPI survey or handing them out for physical completion is also an option, analysing the results and entering data into a computer takes time. While questions requiring written comments (e.g. ‘how we can improve our service?’) can give a lot of detailed information, putting this information into a computer is a time consuming and daunting task. Try to use check boxes or Likert scales for your questions. These are can be easily measured and visualised by dashboard programs. Remember though, information from comment boxes aren’t needed in dashboards (unless you code them) so include them if you need very detailed views or opinions that don’t fit into pre-written questions. a. Clearly state what you want to know, without being vague. b. Make sure that your question is easy to understand, without any superfluous language. c. With scales, make the available options easily categorised. 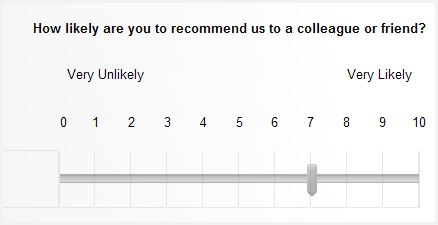 For example, using ‘good’ and ‘very good’ as scale options can confuse respondents. It is easier to distinguish between ‘good’ and ‘excellent’, though the information you’re asking for hasn’t changed. If you follow these tips, you will be able to easily visualise your KPI data from surveys later. To visualise your KPI questionnaire data on a KPI dashboard, your data usually has to be in a data table (like an excel spreadsheet). 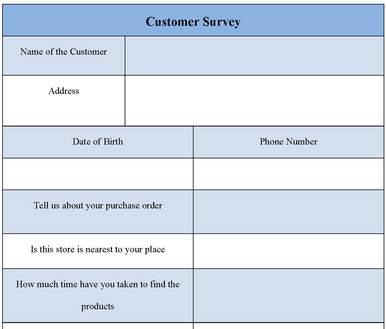 But since surveys are just a list of choices, you need to design a table for the responses to go in. While simple yes/no questions are easy to put into table format (as above), you can also get detailed KPI information from multi-layer questions. ii. Rate certain service criteria for those stores (Speed of Service, Product Knowledge) against a 5-point Likert Scale (very poor, poor, average, good, and excellent). From these responses, you can calculate the customer satisfaction index of your responses. This shows a percentage value of the overall impression of each criterion, as well as the impression of each store as a whole. 1. 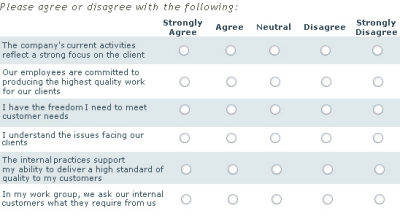 Give each Likert scale option a value which represents the opinion, (e.g. 100 for excellent, 75 for good, etc.). This gives it a weighting, which will let us calculate the overall opinion. 2. Multiply the number for each option’s respondents by its assigned value. 3. Average out the number of respondents (each multiplied by their option’s weighting). This will give you the overall % satisfaction of that criterion. The actual difficulty is not in getting this information, but automating it in a formula column on your data table. Usually, you would have to do this manually, but Target Dashboard can do this automatically for you. To calculate the CSI of stores (which requires the individual criteria information for), you would usually have to place each criteria in the same data row, as below. However, with dashboard software such as Target Dashboard, you can see the CSI scores for each store in the same chart through filtering. This makes your data table far easier to understand and keep track of. Notice how there are two text columns in the table below, Store and Experience. This makes the data easier to filter later. The Net Promoter Score (NPS) KPI is similar to the customer satisfaction index, but aims to show the overall company progress, rather than how people feel about aspects of the company. As I mentioned in my previous post, the CSI score for the above table shows the overall satisfaction of your customers either at experience level or store level. To get your NPS, simply find the percentage of responses that are detractors and promoters, and subtract the % detractors from %promoters. This percentage is your NPS. While you have to be wary of using percentages in calculations, this one works because the percentages are equally weighted. The NPS can therefore be anywhere from -100% (everyone is a detractor) to 100% (everyone is a Promoter). In some ways, the NPS KPI is more powerful a KPI than CSI, as it shows how your company’s reputation and trust is progressing in the eyes of your customers. Now that we have seen how to get both both your CSI and NPS KPIs from survey responses, we can now visualise this in a survey dashboard to compare and break down the data. Survey data is very useful because you can compare information from different parts of a company. For the CSI scores in particular, you can potentially compare CSI for each individual stores, to see which needs improvement. Breaking down your data in this way is very easy with an application like Target Dashboard, which filters your data in a few clicks! To show you how to visualise and drill into your survey data, I’m going to concentrate on CSI score, as the NPS score is a single display from a single survey question, and easier to display. We need to be able to show the overall CSI per store, as well as for each aspect of customer service. 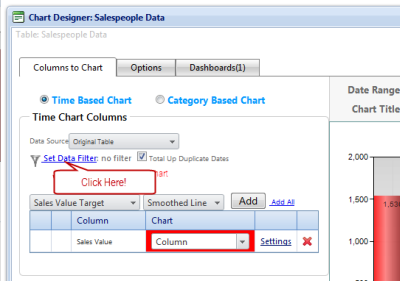 Once you have this entered, create a chart with the CSI data shown. Here, the CSI data for Experiences is displayed, as this is the highest-tiered category in our table. In order for us to see the CSI scores for the store branches, we have to calculate them using the experience CSI scores. 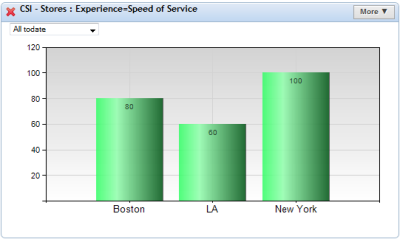 Now, if we apply a filter to this table, we can see the experience CSIs for a particular store, such as Boston. From this chart, we can see that in Boston, every experience criteria is higher than the overall CSI for each experience. What the filter has done is discarded the data associated with the LA and New York stores, and recalculated the CSI using nothing but Boston’s data. Being able to filter out the CSI scores means that you can compare each city against each other in a different graph, and spot where improvement is needed. But, this is just one perspective of the CSI data. 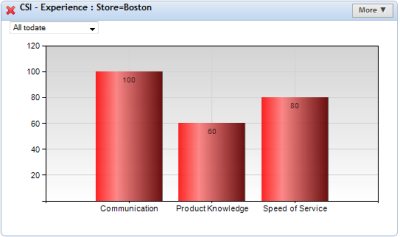 What we can also do is show the CSI scores for all of our stores. This is the exact same data as the earlier chart, but shown in a different way. 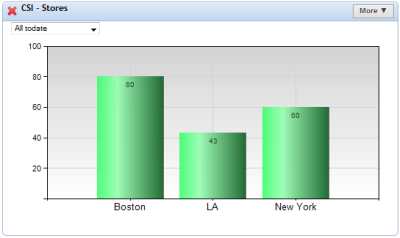 This lets users spot data trends that were hidden by the previous chart, such as LA’s comparatively bad performance to Boston’s. We can further break down this Store data in the same way as the Experience data. Let’s show just the speed of service CSI for each store. LA clearly needs to be a little bit quicker! Though I’ve shown you how filters can help you see your CSI KPIs in different ways, your NPS score can also be shown in your survey dashboard. This just requires a table and score column, like the CSI data table. No filters are needed, as the score is measured over just one set of data with no categories. Survey Data is easily analysed using Filters! · Design your questionnaires to be collected by a computer, saving you time entering the responses manually. 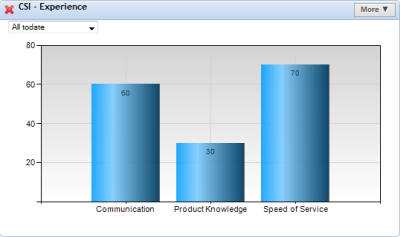 · Arrange your survey responses in a data table, so that dashboard software can understand it. · Calculate the Net Promoter Score and Customer Satisfaction Index, as these are common, powerful KPIs that show the progress of your company. · Use filters to see different sets of data in your survey dashboard. By following these tips, your surveys will become useful sources of information which you can make better decisions from. To make analysing your surveys even easier, some applications such as Target Dashboard allow you to filter data automatically, as I have shown you in this post. To see how easy these tools are to use, sign up for a free demonstration now!